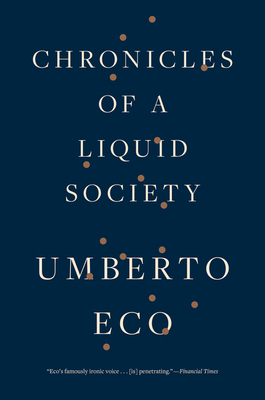 In these pieces, written for his regular column in L’Espresso magazine, Eco brings his dazzling erudition and keen sense of the everyday to bear on topics such as popular culture and politics, being seen, conspiracies, the old and the young, new technologies, mass media, racism, and good manners. It is a final gift to his readers—astute, witty, and illuminating. RICHARD DIXON lives and works in Italy. His translations include works by Umberto Eco, Roberto Calasso, and Giacomo Leopardi. His translation of The Prague Cemetery by Umberto Eco was short-listed for the Independent Foreign Fiction Prize in 2012.